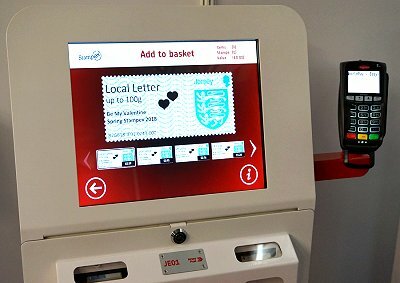 In 2018, Jersey Post again installed its JE01 philatelic kiosk at London Spring Stampex. 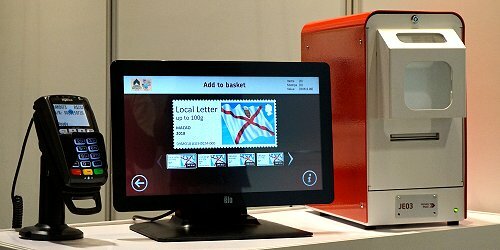 Following Royal Mail's decision not to install kiosks and to reduce their presence at philatelic fairs, the new 'Post & Go' zone was moved from the central area of the Business Design Centre to one end of the gallery bays, on the top floor. 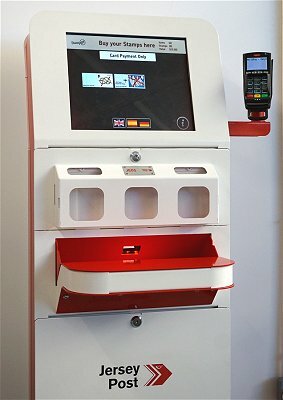 Here the JE01 machine shared the space with the Guernsey Post and Royal Gibraltar Post Office kiosks, as well as the Cartor Security Printing demonstration machine (More information). With a similar issuing policy shared by the three postal administrations in recent years, the definitive design produced by the kiosks during Spring Stampex included a special commemorative imprint, in this case dedicated to Valentine's Day. next two graphic designs in the shape of hearts. 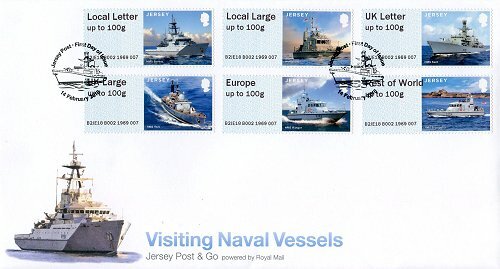 A new 'Visiting Naval Vessels' thematic series was also available from the kiosk, without any special impression. The first block of the code at the bottom of all the stamps issued by the kiosk at this philatelic event is B2GB18 JE01-, followed by the session and stamp number. The new series features six Royal Navy vessels that have taken part, in recent years, in the Jersey Boat Show, a maritime event held annually in the port of Saint Helier. The ships are HMS Severn, HMS Raider, HMS Kent, HMS York, HMS Ranger and HMS Trumpeter. All Royal Navy vessels include the prefix HMS, which stands for 'Her Majesty's Ship'. Jersey Post produced a presentation pack and a pictorial first day cover, together with a special postmark exclusive to this philatelic product. The illustrations of the stamps and other philatelic products produced with this series are by Andrew Robinson. 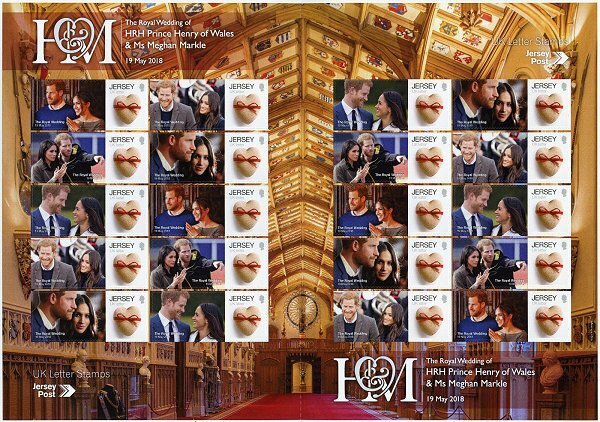 The new series could be obtained, from February 14th 2018, from the JE01 philatelic kiosk, installed temporarily at London Spring Stampex 2018, and from the JE02 kiosk permanently installed at Broad Street Post Office, in Saint Helier, Jersey, with the usual permanent imprint 'Broad Street'. 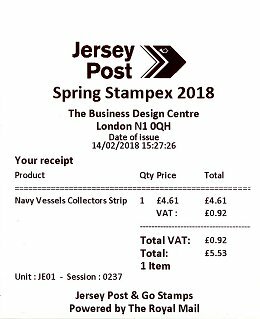 Receipts of the 'Visiting Naval Vessels' six-value set or Collectors Strips, issued by the kiosks installed at Spring Stampex 2018 and Broad Street P.O., respectively. 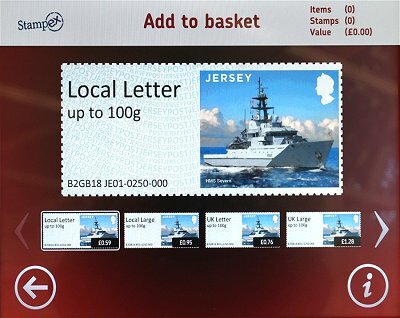 The stamps bought in the London postal kiosk had a 20% surcharge on the face value, because of the VAT on sales made by Jersey Post in the UK. 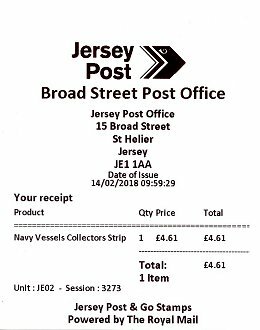 Jersey Philatelic Bureau The Jersey Philatelic Bureau sells six-value sets or Collectors strips with 'The Crest of Jersey' series and the Spring Stampex 2018 special text, plus the new 'Visiting Naval Vessels' series, all issued from the back office printer B002. All the stamps included in the presentation packs and first day covers (upper image) have the same code at the bottom - B2JE18 B002-1969-007 (it is the 7th 'Post & Go' pictorial series). Jersey Post also produced mint Collectors strips, again issued by the B002 printer and sold along with a first day receipt, in which the bottom code is not identical for all stamps, but with sequential session and stamp numbers (right strip). 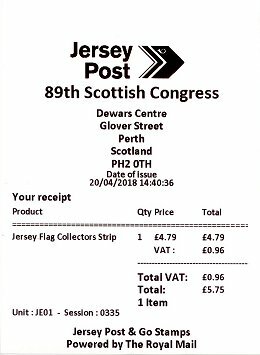 The JE01 Jersey Post's kiosk attended the Perth congresses of the Association of Scottish philatelic societies in 2014, 2015 and 2016, and returned for the fourth time in 2018 (More information, also published in VARIABLE 49). On November 27th 2017, Prince Charles announced the engagement between his son, Prince Harry, and American actress Rachel Meghan Markle. The wedding was celebrated on May 19th 2018, in the Chapel of St. George, at Windsor Castle. This major social event was celebrated by most of the philatelic services of the British Commonwealth, who issued all kinds of commemorative philatelic material. Among them, Jersey Post, who released a sheet of 20 stamps and vignettes illustrated with images of the couple (image below), and in addition programmed a special imprint on the stamps issued by the JE02 'Post & Go' kiosk installed at the Broad Street post office in Saint Helier, Jersey's capital. next to an image or graphic depicting wedding bells. The second Jersey special imprint of the year marks the 10th anniversary of "Holidays for Heroes Jersey", a local charity founded on August 28th 2008 with the aim of providing a week’s holiday on the island, to any member of HM Forces with injuries, attributable to their service. 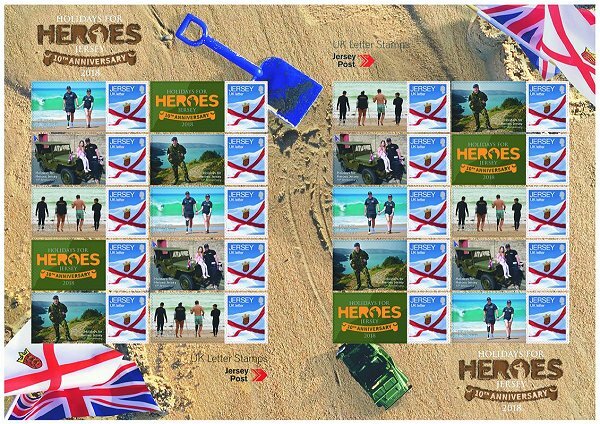 On the occasion of this anniversary, Jersey Post released a sheet of 20 stamps and vignettes illustrated with images of different fundraising events and families enjoying their holidays in Jersey (image below), and programmed a special imprint on the stamps issued by the JE02 'Post & Go' kiosk installed at the Broad Street main post office, in Saint Helier. next to the image/graphic of the charity's logo. 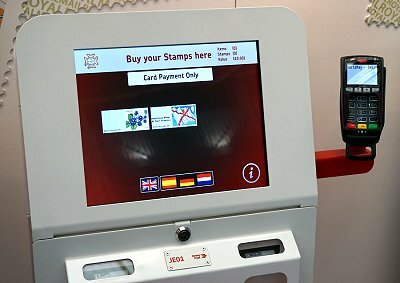 After Spring Stampex and the Perth Congress, the Jersey Post JE01 philatelic kiosk returned to London for Autumn Stampex, its third and final appearance in 2018. 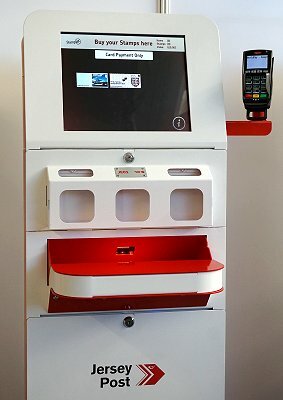 In the new 'Post & Go' zone, the machine shared the spotlight with the Guernsey Post and Royal Gibraltar Post Office kiosks (More information). next to a graphic design with the image of a Spitfire aircraft, from one of the printers. 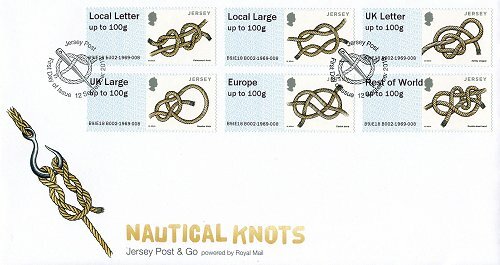 Jersey Post also took advantage of this philatelic fair to release the new 'Nautical knots' thematic series, issued by the second kiosk printer without any special imprint. The first block of the code at the bottom of all the stamps issued by the kiosk at this philatelic event is B9GB18 JE01-, followed by the session and stamp number. With a theme very appropriate to the island's maritime history, the new series features a selection of six nautical knots - the Ashley Stopper, Bowline hitch, Carrick bend, Double sheet bend, Fisherman's knot and Reef knot. The illustrations of the stamps and other philatelic products produced with this series are by the internationally know artist Martin Mörck. 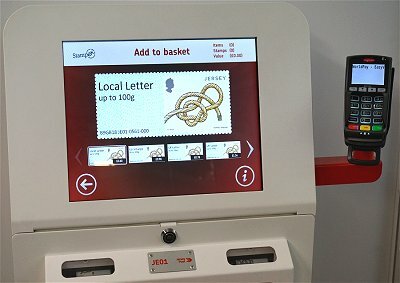 The new series was available from September 12th 2018 from the JE01 philatelic kiosk, installed temporarily at London's Autumn Stampex 2018, and from the JE02 kiosk permanently installed at Broad Street Post Office, in Saint Helier, Jersey, with the usual permanent imprint ' Broad Street ' (images below). In addition, the Jersey Philatelic Bureau offers six-value sets or Collectors strips with the 'Jersey flag' definitive design and the Autumn Stampex 2018 special imprint, plus the new 'Nautical knots' series. These are all issued from the back office printer B002. All the stamps included in the presentation packs and first day covers (upper image) have the same code at the bottom - B9JE18 B002-1969-008. Jersey Post also produced mint Collectors strips, again issued by the B002 printer and sold along with a first day receipt, in which the bottom code is not identical for all stamps, but with sequential session and stamp numbers (left strip below). 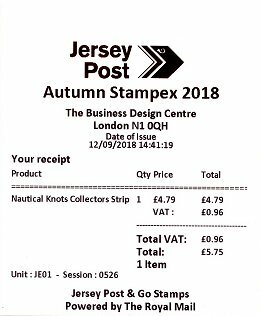 Receipts of the 'Nautical knots' six-value set or Collectors Strips, issued by the kiosk installed at Autumn Stampex 2018 and Broad Street P.O., respectively. 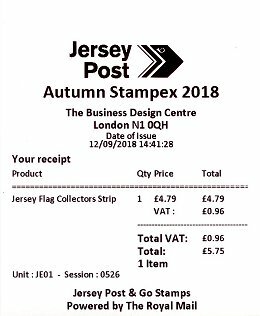 The stamps bought in the London postal kiosk had a 20% surcharge on the face value, because of the VAT on sales required by Jersey Post in the UK. 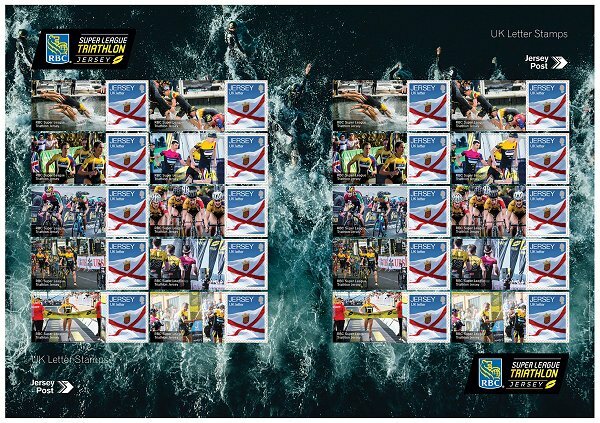 After the success of the 2017 competition, the Super League Triathlon was held once again in Jersey from September 28th to 30th 2018, with the participation of fifty of the world's leading male and female triathletes. For the second consecutive year (see article, also published in VARIABLE 46), Jersey Post commemorated this major international sporting event by releasing a sheet of 20 stamps and vignettes illustrated with images of the competition (image below), and programmed a special temporary imprint on stamps issued by the JE02 'Post & Go' kiosk installed at the Broad Street main post office, in Saint Helier. 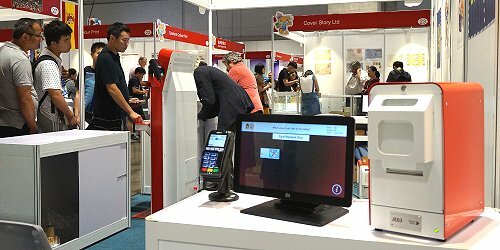 Like the Royal Gibraltar Post Office (see article, also published in VARIABLE 50), Jersey Post took advantage of one of the main philatelic events in 2018, the 35th Asian International Stamp Exhibition held in Macao, to present its new DKU (Desktop Kiosk Unit) (More information). 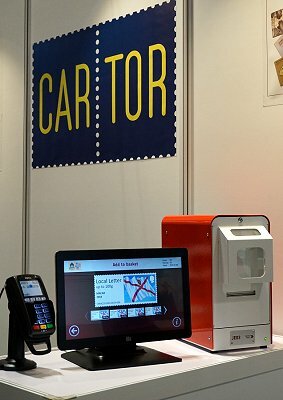 Both machines were installed on Cartor Security Printing's large stand, next to the CSP1 demonstration kiosk (image below). The new Jersey Post DKU counter unit with code JE03 is the third equipment used by the philatelic service for the issue of variable value stamps. With similar performance to the 'Post & Go' kiosks, its small size allows for its installation at temporary philatelic events, and at the same time as the back office equipment for the printing of stamps sold by the philatelic service; probably with a special code. 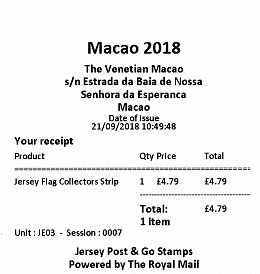 In Macau 2018, Jersey Post decided to issue variable value stamps with the 'Jersey flag' definitive design. 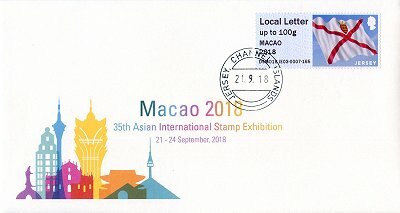 All the stamps include the ' MACAO 2018 ' special imprint below the face value indicator. The first block of the bottom code is D9MO18 (D identifies the DKU equipment, 9 for the month, MO is the international standard code for Macau, and 18 for the year of issue), followed by the machine code (JE03), the session and stamp numbers. The unit was programmed with the same set of six tariffs programmed in the two philatelic kiosks JE01 & JE02, which includes the first two postal rates for local and United Kingdom mail, for normal size and 'Large' letters, plus the two tariffs, in the first weight step up to 100g, to Europe and rest of the world.